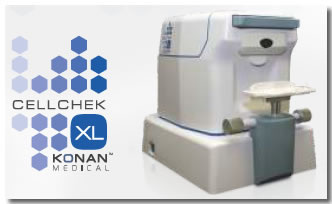 The Konan Specular Microscope measures the corneal endothelium. This is the innermost layer of your cornea and its the most fragile layer because it is only one cell thick. The endothelial cells maintain the fluid balance of the cornea which is necessary to maintain clear vision. Unlike most cells in the body, endothelial cells cannot replicate themselves. ​If these cells become sufficiently damaged, the cornea loses its clarity and clouds up, limiting or blocking vision. So, What Causes Endothelial Damage? The procedure to evaluate your endothelium is simple, quick, non-invasive, and totally free of any discomfort. A special instrument called a specular microscope captures and image of your endothelium and allows us to analyze the appearance of the endothelial cells. If the screening examination indicates early endothelial cell damage, a more detailed examination of the endothelium may be indicated to provide the best possible treatment.